. –  ZIMBABWE ALERTS :     –     .
.        Drive Safely. Have a wonderful trip. Enjoy Zimbabwe’s wealth of Game Reserves and wildlife ….
.     –    ZIMBABWE ALERTS :     –     .
.         Drive Safely. Have a wonderful trip. Enjoy Zimbabwe’s wealth of Game Reserves and wildlife   …. Useful Phrases in Zimbabwe Visas Weather What! Need to know more? Zimbabwe (also known by its former name Rhodesia), is a beautiful country in Southern Africa between the Limpopo River and Zambezi River bordered by Botswana to the west, Mozambique to the east, Zambia to the northwest and South Africa to the south. Most parts of Zimbabwe from the south west to the northern region is elevated and consists of a central plateau known as high veld, while the eastern parts of Zimbabwe are mountainous with the majestic Mount Nyangani being the highest point of Zimbabwe. Zimbabwe has a rich diversity of flora and fauna, wildlife with over 350 mammal species, over 500 bird species and around 131 fish species making it one of the best destinations to go on safari. The predominant flora of Zimbabwe is the miombo woodland. The highlands, and grassy plains of Zimbabwe are known for their breath-taking beauty and must-see destinations in Zimbabwe will include the Chirinda Forest at Mount Selinda, Nyanga, Chimanimani, Vumba, Troutbeck, World’s View at the Matobo Hills and the world-famous Victoria Falls. Tourist attractions for Zimbabwe will include the beautiful 11 National Parks, The Victoria Falls, Lake Kariba, the Zimbabwe National Monument and the various ancient ruined cities in Zimbabwe such as The Great Zimbabwe Ruins, the Khami Ruins, Dhlo-Dhlo and Naletale. Activities to do in Zimbabwe will include Game Viewing, Bird Watching, Safaris, Bungee jumping, Canoeing, Sunset River Cruises, River rafting, Fishing, Hiking and much more. 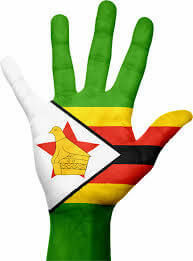 The Zimbabwean flag consists of 7 equal horizontal stripes, (two green, two yellow, two red and one black stripe) and a white triangle with a red star with the yellow Zimbabwean bird on. The green stripes represent the country’s vegetation, agriculture and land resources, the yellow stripes represent the country’s mineral wealth, the red stripes represent the blood spilt during the liberation and armed struggle and the black stripe represent the black majority. The white triangle represents peace and the “way forward” while the red star stands for internationalism and the nation’s aspirations while the yellow bird is Zimbabwe’s national emblem. Harare is the capital city of Zimbabwe. There are 17 official languages in Zimbabwe while Zimbabwe’s official language is English and the primary languages for Zimbabweans is Shona and Ndebele. Zimbabwe earned its nicknames “The Breadbasket of Africa” and “The Jewel of Africa”, through its tourist attractions and natural wonders. Zimbabwean people are very friendly and eager to help tourists with directions or suggestions. In general, Zimbabwe is safe and has one of the lowest crime rates in Africa, however crime is present and occasional robberies do occur. Zimbabwe is considered a safe country for tourists however tourists are advised to take the normal and usual travel precautions when traveling to any destination. Majority of Zimbabwean religion is Christian. Zimbabwe has various cultures of which Shona is the largest. Traditional arts form a vital part of the Zimbabwean lifestyle and includes pottery, textiles, basketry, jewellery, sculpture and carving (world-famous Shona sculpture) all made out of high-grade materials. Tourists love buying the symmetrically patterned woven baskets, wood carved stools, stylized bird and human figured carvings made with soapstone, serpentine and verdite. Zimbabwe has a national annual beauty pageant called Miss Heritage Zimbabwe. When you are packing your clothes for your holiday in Zimbabwe, please keep in mind that military or camouflage clothing is illegal in Zimbabwe. It is best to pack casual and comfortable clothing, while layers of clothing will be most practical for the fluctuating day/night temperatures in Zimbabwe. If you are going on safari, dull and neutral colours like beige and brown should be worn instead of white, bright or light colours. If you are visiting Zimbabwe during the winter period (May – August), remember to pack long-sleeve jackets, shirts, trousers and pyjamas as the evenings can be very cold. The standard Zimbabwean time is GMT+2. There are a variety of International Hotels, Lodges, Motels, Safari Camps, Tented Camps, Camping Sites, Chalets and Guesthouses available for accommodation in Zimbabwe that caters for all budgets. Most hotels require your passport when you check in, so have it handy to save yourself some time. Overall, Zimbabwe is a great destination to go on holiday and there are many things to see and do. The original Zimbabwean currency, the Zimbabwe Dollar, has been withdrawn from circulation and the official currency used in Zimbabwe now is the US Dollar, although South African Rand, Euro, Botswana Pula, Indian Rupee, Chinese Yuan, Australian Dollar, Japanese Yen and the British Pound are also considered legal tender. Travelers Cheques are not accepted. You can click on the link for the current rate check www.xe.com. Zimbabwe has a developed but not very extensive banking network and it is very difficult to withdraw cash from ATM’s using your Visa or Mastercard in shopping centres or banks, thus it is worthwhile to stock up with cash. Whilst more and more establishments in Zimbabwe now accepts international debit and credit cards, the use of credit cards is still very limited with only a few establishments accepting VISA or MasterCard, yet one cannot rely on it and it is better to email the establishment beforehand to find out if they accept your specified debit or credit card. Keep your cash reserve in a safe place and only carry as much cash as you would need when you leave your accommodation establishment. Prices in establishments and shops are usually quoted in US Dollars as the US Dollar and Zimbabwe Bond Notes are the most commonly used and are accepted in all shops and accommodation establishments in Zimbabwe. Due to the cash scarcity in Zimbabwe, it is best to have small denominations of notes with you, as most retailers use Bond Coins/Notes for change, or they offer a receipt for change that can be used on your next visit toward the price of your order. The smallest denomination of US Dollars in Zimbabwe is a $1 note. The denominations of Bond Coins are 1, 5, 10, 25 and 50 cents (they are on par with American coins). Some shops/supermarkets in Zimbabwe might even give change in chewing gum or sweets if there is no coinage available. Tourist can haggle for better prices, but it is best to keep in mind that most people are very poor. Zimbabwe has a very diverse cuisine. The most popular cuisine dishes for Zimbabweans are their staple food Mealie Meal that’s used to prepare Bota/Sadza (porridge made from the mealie meal (cornmeal) by mixing the mealie meal with water) served with vegetables, beans, meat and tea / served with boerewors (sausage made with beef or pork) or curdled milk. Rice, Chicken and Coleslaw salad is also a popular main meal. Other popular foods that make up Zimbabwean cuisine will include Biltong, Pasta, Potato-based foods like French Fries and Mashed Potato. The traditional dish for Zimbabweans is a dish called Mutakura which consists of peanuts (known as nzungu), boiled and sundried maize, black-eyed peas (known as nyemba) and babara groundnuts (known as nyimo). Local snacks in Zimbabwe includes maputi (roasted/popped maize kernels), roasted and salted peanuts, sweet potato, sugar-cane and pumpkin. Various vegetables and indigenous fruits such as horned melons are also found in Zimbabwe. There are various imported drinks, alcoholic beverages, soft drinks and Mazoe (local orange squash) available in Zimbabwe. Bottled water is widely available, and it is advised to rather drink bottled water than tap water in Zimbabwe. Zimbabwe has 20 Airports and the two international airports in Zimbabwe is the Joshua Mqabuko Nkomo International Airport in Bulawayo and the Robert Gabriel Mugabe International Airport in Harare. Zimbabwe has standard gauge Railways and Roadways in various conditions (paved and unpaved). There are Waterways on the Zambezi River and Lake Kariba. Public transport in Zimbabwe is available via metered taxis, express or luxury busses and by train. The Zimbabwean communication infrastructure caters for cell phones, landline telephones, internet connections, radio, television and postal services. There are three GSM mobile phone networks in Zimbabwe namely Econet, Net One and Telecel. Tourists can buy sim cards relatively cheap for any of the mobile networks in Zimbabwe. Cell and Internet coverage is fair in most parts of the country except in remote areas of National Parks and outside the cities in the countryside. The international dialing code for Zimbabwe is +263. Data rates are reasonable, but it is always best to do downloads and updates when WI-Fi is available to save on data costs. Zimbabwe has a state-controlled television station namely ZBC available and satellite TV is available as well. The ZBC National FM radio broadcasts news and current affairs in English language. Postal services such as Zimpost is available in Zimbabwe and international courier services are also available. Electricity supply in Zimbabwe is 220 volts running at 50Hz frequency. Type D (three round pins in a triangular pattern) and Type G (three rectangular pins in a triangular pattern) plugs are used in Zimbabwe. If you live in South Africa, you will need a power plug adapter for type D and G plugs. There are large supermarkets and shops available in Harare and Bulawayo for tourists looking to do some shopping. There are small supermarkets, markets and roadside vendors available in towns and villages throughout Zimbabwe. Tourist can haggle for better prices, but it is best to keep in mind that most people are very poor. The Hwange National Park (also known as the Wankie National Park) was named after a local Nhanzwa chief and is located in the northwest part of Zimbabwe between Victoria Falls and Bulawayo. The Hwange National Park is the oldest and largest park in Zimbabwe and is 14 650sq km big. The park is one of the greatest elephant sanctuaries in Africa with more than 40,000 elephants and it offers fabulous game viewing as it boasts a huge selection of wildlife with over 400 bird species and over 100 species of mammals. Some of the wildlife in the park includes the Big 5 (Lion, Leopard, Rhino, Elephant Buffalo), South African Cheetah, The Brown Hyena, The African Wild Dog, 16 types of Antelope and many more. The park offers accommodation in lodges, cottages, camp sites and chalets. Activities to do in the park will include Game Viewing, Mobile Safaris, Game Drives, Bird Watching, 2-8-day Walking Trips and several waterhole viewing platforms and hides. The best time to visit the park is between the months of August to October. The spectacular Mana Pools National Park is a UNESCO world heritage site and it’s located in the Manapools region in Mashonaland in Zimbabwe. The park is located along the shores of the Zambezi River and offer breath taking nature scenes including inland pools, mixed woodlands and open grasslands. The park is over 2196sq km big and offer an abundance of Aquatic wildlife like Tiger Fish, Tilapia, Bream, Chessa, Eel Fish, Vundu, Electric Fish, Nkupi, Lung Fish, Cornish Jack and many more. Mammals such as Elephants, Rhinos, Wildebeest, Lions, Antelopes like Nyala, Eland, Waterbuck, Impala, Kudu, Hartebeest, Crocodiles, Buffalos, Hippos, Giraffes, Zebras, Leopards, Wild Dogs, Hyenas and many more roams the beautiful picturesque landscapes and pastures of the park. The park boasts over 350 water and woodland bird species like Livingstone’s Flycatchers, Bee-eaters, Vultures, Geese, Kingfishers, Yellow-spotted nicators, African skimmers, Plovers, Goliath herons, Fish eagles, Nyasa lovebirds, Cormorants, White-collared pratincole, Storks, Egyptian and Spurwing geese, Banded snake-eagles and many more. The park offers accommodation in camp sites, chalets and luxury lodges. Activities to do in the park will include Game Viewing, Game-Viewing on foot, Walking Safaris, Game Drives, 5-day Trips down the river, Bird Watching, Fishing and Canoeing. The Mana Pools National park opens during the dry season in Zimbabwe from April – November and visitor numbers are restricted. The Matobo National Park also known as the Matobo Hills National Park or Matopos, is a beautiful national park with enormous granite boulders and balancing rock towers, located close to Bulawayo in Zimbabwe. The park received UNESCO World Heritage status in 2003, is 43,200 ha big and the famous King Mzilikazi and Cecil Rhodes are buried in the national park. The park boasts beautiful botanical landscapes filled with various trees, shrubs, wild herbs, flowers, aloes and over 100 grass species. There are over 88 Mammal species, 175 Bird species, 16 Fish species and 39 Snake species located in the park. The park offers accommodation in chalets, camping sites, lodges and guesthouses. Activities to do in the park will include Game Viewing, Scenic Drives, Horse-Riding, Hiking and Bird watching. The massive 5000sq km Gonarezhou National Park is an untamed wilderness area with great wildlife diversity that borders South Africa’s Kruger National Park and Mozambique’s Limpopo National Park. Wildlife in the park includes the Big 5 (Lion, Leopard, Rhino, Elephant, Buffalo), Wild dogs and a variety of Antelope such as Sable, Roan, Nyala and many more. There is limited accommodation facilities but a few lodges are available in the park. The best time to visit the Gonarezhou National Park will be during the dry season from June to October. Activities to do in the park will include Game Drives, Game Viewing, Bird Watching and Walking Safaris. The 47 000 hectare Nyanga National park with it’s picturesque rivers, waterfalls and rolling green hills is located in the north of Zimbabwe’s Eastern Highlands 268km from Harare. The park hosts Mount Nyangani, the highest point in Zimbabwe and the Mutarazi Falls, Zimbabwe’s highest waterfall. Wildlife in the park includes Elephants, Antelopes, Zebra’s and many more. Accommodation in the park includes 3 rest camps, self-catering lodges and camping sites. Activities to do in the park includes Mountain Climbing, Visiting the various waterfalls in the park, Hiking and Game Viewing. The Nyanga National Park promises their visitors an unforgettable holiday experience. The beautiful Zambezi National Park with its scenic mopane woodland, ebony-, apple-ring-, fig trees, and riverine forest is located next to the Victoria Falls on the Zambezi River and is 56,000 hectares big. Wildlife in the park includes Giraffes, Elephants, Buffalos, Zebras and various Antelopes such as Waterbuck, Sable, Impala, Lions, Leopards, African Wid dog, Crocodiles, Hippos and many more. Accommodation in the park includes lodges on the riverbank, resorts, campsites and hotels. Activities to do in the park would include Game Viewing, Game Drives, Fishing, visiting the majestic Victoria Falls and much more. The best time to visit the park would be in the dry season from April – October as that is also the time when the Victoria Falls is at its most thunderous due to the Zambezi River’s peak water flows. Zimbabwe has hospitals and healthcare facilities however, many medicines are in short supply or can’t be sourced, thus we strongly advise you to take all your medications with you when you travel to Zimbabwe. Strongly advised vaccines recommended for safe travel to Zimbabwe will include Yellow fever, Hepatitis A and B, Typhoid fever, Cholera, Rabies and Influenza. It is extremely important to visit your doctor ideally 4-6 weeks before your trip to get your vaccines or medicines you may need. Zimbabwe has one of the highest incidences of AIDS in the world. Bilharzia is present in some lakes in Zimbabwe, thus for your own health and safety, always ask locally before swimming or drinking water (non-bottled) from lakes. There is a risk of malaria when traveling to Zimbabwe, so it is best to take anti-malarial prophylactics. Precautions that you can take to avoid getting infected with Malaria will include sleeping under mosquito nets, using mosquito repellent on the skin, burning mosquito coils and wearing long sleeved clothing and long trousers in the evenings. When going on walking/hiking safari trips, keep in mind that snakes and scorpions are common in the bush and long grass, and most of their bites are on the foot or lower leg, thus it is advised to wear proper boots with long trousers and thick concertinaed hiking socks. Always remember to shake out your shoes before wearing them again. If you should get bitten or stung, please stay calm and keep in mind that many bites and stings are non-fatal, thus try to identify the culprit and then get medical attention as quick as you can. These health tips are just a guideline; thus, we recommend that you always seek up to date advice from your doctor before traveling to any destination. For your own health and safety, it is best to check the vaccines and medicines list for the country you are travelling to and visit your doctor (ideally 4-6 weeks) before your planned vacation or trip to get vaccines or medicines you may require. It is best to ensure that you are up to date on routine vaccinations while travelling to any destination. You can ask your doctor what vaccines and medicines you need based on where you are going, how long you are staying, what you will be doing, and if you are traveling from any country other than the U.S. Some vaccines like Yellow Fever is a compulsory vaccine and also a legal requirement in many African countries, and you will be refused entry if you don’t have proof of the vaccine with you, thus it is always good practice to check with the embassy of your chosen destination to find out what vaccines are compulsory. Some vaccines may also be required for your travel, for a full list of medical requirements, check the Centers for Disease Control and Prevention website. For more information on how to stay safe during your travel to Zimbabwe, please see the following page: Staying Healthy and Safe in Zimbabwe. There are no notices currently in effect for Zimbabwe. Please note that when traveling on Zimbabwean Roads, driving is on the left-hand lane of the road. All road traffic signs in Zimbabwe are in English. The speed limit in Zimbabwe on open roads is 120 km/h and the speed limit in urban areas is 60 km/h. Zimbabwean main roads are paved (tarred) and in fairly good condition but be aware of potholes on non-main roads. Frequent roadblocks (roadside checks) are held to check motorist’s documents and safety equipment. Always be friendly and courteous when you are approached by a law official as rude behaviour will land you in trouble. It is a rule in Zimbabwe to give way to traffic approaching on the road to the car’s right, at uncontrolled intersections and motor vehicle drivers are required to yield to pedestrians crossing the road on a green light. Drive carefully and when in doubt, obey any law that may apply. One should have red hazard triangles, adhesive reflectors on your car, a spare tyre, high viability vests and at least on fire extinguisher per vehicle. Tourists from Malawi, South Africa, Namibia, Botswana, Lesotho and Swaziland are permitted to drive with their domestic driving licences if issued in their countries as they are valid in Zimbabwe. All other tourists coming from other countries, are permitted to drive on Zimbabwean roads with an International Driver Licence (Permit) for up to 90 days. Car hire is available in Zimbabwe, but it is very expensive and to rent a car, the driver must be 22 years of age or older and the driver must have held his licence for at least one year. Busses, Metered Taxis and Minibus taxis are available for public transport in and around Zimbabwe. Fuel stations are readily available in most cities and towns, and charge in US Dollars for the fuel, however it’s best to always keep a half tank of fuel or a spare can of fuel in your vehicle, as you are not guaranteed that the next city or town will have fuel. Fuel is imported to Zimbabwe and is there for a bit more expensive than in other Southern African countries, and most fuel stations in Zimbabwe doesn’t take credit cards. There are a number of tollgates on inter-city roads which cost $2 each and its payable in cash. It is advised to use toilets that are available at fuel stations when you stop to fill up your vehicle, as the next toilet might be very far from your current stop. Remember to take toilet paper with you as some toilets might not have toilet paper available. Be careful when driving on Zimbabwean roads as animals such as goats, donkeys, dogs, cattle and local people wearing dark clothes walk along and, on the roads, especially at night. Zimbabwe is known for its fabulous tourist attractions, thus while on vacation in Zimbabwe, you can visit the Chirinda Forest at Mount Selinda, Nyanga, Chimanimani, Vumba and Troutbecthe. Some of the popular must-see tourist attractions will include the beautiful National Parks of Zimbabwe, the majestic Victoria Falls, Lake Kariba, the Chinhoyi Caves, World’s View at the Matobo Hills, the Zimbabwe National Monument and the various ancient ruined cities in Zimbabwe such as The Great Zimbabwe Ruins, the Khami Ruins, Dhlo-Dhlo and Naletale. Activities to do in Zimbabwe will include Game Viewing, Bird Watching, various types of Safaris, Bungee jumping, Canoeing, Sunset River Cruises, River Rafting, Fishing, Hiking and much more. The Victoria Falls also locally known as “Mosi-oa-Tunya – The Smoke That Thunders,” is located on the border between Zimbabwe and Zambia. The Victoria Falls is 1,708 meters wide and 108 meters high resulting in it being the world’s largest waterfall, and one of the most monumental natural wonders of the world. David Livingstone, a Scottish explorer and missionary was the first European to view the Victoria Falls from Livingstone Island (one of two land masses in the middle of the Zambezi river) on 16 November 1855 and therefor the Livingstone Island was named after him. He named the waterfall, the Victoria Falls in honour of Queen Victoria of Britain. When he saw the falls for the first time, he said “scenes so lovely must have been gazed upon by angels in their flight”. The falls are formed as the full width of the Zambezi river plunges down the gorge, resulting in a strong constant spray rising to a height of over 400 meters or more, that can be seen up to 48km away. During the day the spray forms a “rainbow” and at night when its full moon, it forms a “moonbow” and therefor locals also named the falls “Seongo” or “Chongwe” which means “The Place of the Rainbow”. The best time for tourists to view the Victoria Falls, is during the rainy season from March to May, when they are at their most spectacular. There are many viewpoints and walkways at the Victoria Falls and activities to do there would include Bungee Jumping, walking along Victoria Falls Bridge, Whitewater Rafting, Visiting the falls, Swimming in the natural rock pools, Sunset Cruises on the Zambezi river, Game Viewing and much more. The Great Zimbabwe was the medieval capital city of the Kingdom of Zimbabwe and Queen of Sheba during the Iron Age (1100-1450AD) and is now classified and recognized as a UNESCO World Heritage Site. This archaeological site is located in the south-eastern hills of Zimbabwe near the Masvingo town and “Zimbabwe” means “ruins” in the Shona language. Constructed from thousands of stones balanced on top of one another without mortar, The Great Zimbabwe Ruins are the remains of three connected granite stone complexes (Hill Ruins, Great Enclosure, Valley Ruins) full of ruined towers 22m high, turrets and 36ft high walls spanning 1,800 ac (700 ha) and covering a radius of 100-200 mi (160-320 km). The construction of the stone buildings started from the 11th century and continued for over 300 years resulting in The Great Zimbabwe Ruins being some of the oldest and largest structures located in southern Africa. The Great Zimbabwe National Monument (open daily from 7:45am – 4:45pm) hosts important artefacts such as the 8 Zimbabwe Birds carved from soapstone on the tops of monoliths the height of a human, soapstone figurines like the British Museum, Iron Gongs, Pottery, Bronze Spearheads, Copper Ingots, Iron Hoes, Glass Beads, Porcelain from China, Arab Coins and many more. Accommodation at the Great Zimbabwe Ruins will include various hotels and camp sites. Legend say that Great Zimbabwe was once used as a playground by giants, and by visiting the ruins with their high walls and towers you will understand why. Great Zimbabwe is known to be one of the most important and most visited historical sites in Africa. World’s View (also known as Malindidzimu Hill) is a breath-taking vista that covers an area of approximately 70 hectares on the escarpment of the spectacular Nyanga Downs plateau in the mountain range of eastern Zimbabwe. World’s View offers unparalleled 360-degree views of places as far away as 60–70 km (37–43 mi) and the tranquil and serene surrounding fills you with awe, refreshes your mind and leaves you completely at ease. There is a tower at the viewpoint at World’s View that bears a toposcope on which the direction and distance to thirty African localities are inscribed on slabs of black granite. Between the multi-coloured lichen, giant boulders and rainbow-striped lizards, early white pioneers like Cecil Rhodes and Leander Starr Jameson lay buried at World’s View. BirdLife Zimbabwe strives to conserve Zimbabwe’s birds and their habitats. Conserving the wild cheetah population of Zimbabwe. The Environmental Management Agency Zimbabwe, aims to monitor, protect and increase awareness about Zimbabwe’s environment. A collection of useful phrases in Shona, a Bantu language spoken mainly in Zimbabwe. Translations have been kindly supplied by Simon Ager at Omniglot. Key to abbreviations: sg = singular (said to one person), pl = plural (said to more than one person). Long time no see Ko, vemakore! Do you understand? Munonzvisisa here? How do you say … in Shona? Reply to thank you Unotendei? Where’s the toilet / bathroom? Chimbuzi chiripi? Call the police! Daiidzayi mapurisa! A collection of useful phrases in Northern Ndebele, a Bantu language spoken mainly in Zimbabwe. Translations have been kindly supplied by Simon Ager at Omniglot. Key to abbreviations: sg = singular (said to one person), pl = plural (said to more than one person). What’s your name? Ibizo lakho ngubani? Where are you from? Uvela ngaphi? Good luck! Ngikufisela inhlanhla enhle! Do you speak English? Uyakhuluma isikhiwa? Do you speak Northern Ndebele? Uyakhuluma isiNdebele? How do you say … in Northern Ndebele? Kuthwani … ngeSiNdebele? How much is this? Yimalini? Where’s the toilet / bathroom? Ingaphi ithwelethi? Would you like to dance with me? Uyafuna ukugida lami? Call the police! Biza ama pholisa! Please be aware that the information noted below is applicable to tourist visas only. If you’re planning on working, studying, volunteering or living in Zimbabwe, you’ll need a different type of visa altogether that requires additional documentation and must be applied for in advance. You can contact your embassy for more information or see the following links: https://www.evisa.gov.zw, Business Visas, Transit Visas, Conferencing Visas. Passports must be valid for at least 6 months from the date of arrival in Zimbabwe, and should have at least 3 blank pages left in it. Proof of onward/return tickets out of the country is required. Children and babies are charged full visa fees regardless of their age and their passports must be presented as well. For information on cash declarations, you can visit the following links : http://www.zimra.co.zw and Cash Declarations. If you are planning on visiting multiple countries while in Zimbabwe, it is best to get a Double Entry Visa or a Univisa. For day trips between countries while in Zimbabwe, a Univisa is better and more affordable than a Double Entry Visa. Fees for a Univisa may vary, it starts from US$50, is valid for 30 days and it allows multiple entries from each country between Zimbabwe and Zambia. Univisas can be purchased by most Category A and Category B citizens at the Harare International Airport, Victoria Falls International Airport, Victoria Falls land border and Kazungula land border upon arrival in Zimbabwe. Tourists can buy up to 3 Univisas per year. For more information on univisas, see the following links: www.kazavisa.info and VictoriaFallsGuide. If you are returning to Zimbabwe more than twice in one trip, you can apply for a Multiple Entry Visa. Multiple Entry visas can’t be applied for at your point of entry in Zimbabwe, applications can either be done at the Town Hall in Zimbabwe, or at the Zimbabwe High Commission in your country. Holiday visas can be used within three months from the date of issue, and they are issued for a 30-day stay. If you wish to stay in Zimbabwe for longer than 30 days, you can extend the visa at a consulate office. Holiday visas can be extended twice for up to three months free of charge and there is a three day grace period from the visa expiry date. From three months there will be monthly costs involved starting from US$20 per month. For more information, please see the following link https://www.evisa.gov.zw/Help/FAQs. Note that visa rules change frequently, always check the latest visa rules and regulartions regularly. Zimbabwe is known for its tropical climate that’s moderated by altitude and variable weather conditions, but it’s usually sunny and warm in most areas. In general Zimbabwe is a year-round destination that caters for different tourist activities in each season. There is a tropical climate during the rainy season in the summer months from November to March. Winter months in Zimbabwe are generally dry and ranges from June to September with warm temperatures during the day and cool frosty temperatures during the nights. September and October are usually the hottest months. Most tourists prefer to visit Zimbabwe in the dry season (April to October) when the weather is at its best, and the lack of water forces wildlife to be close to rivers, waterholes and lakes making them easier to spot, and thus resulting in game viewing being at its best during this time.